You are currently browsing the daily archive for June 8, 2011. 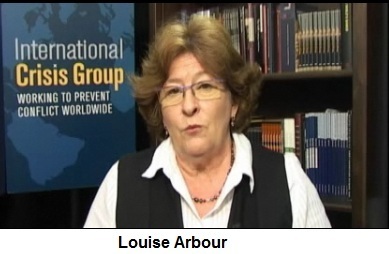 Louise Arbour – Wicked Witch of the West or a Munchkin? I have long had a soft spot for Mr Ban Ki-moon. I realize this might make me unpopular with Sri Lankans who see the UN as a monolith, but I believe that analysis of his statements over the years suggests that he does his best to uphold basic principles, both those of moral decency as well as those on which the UN was founded. He does sometimes succumb to pressure, but many people do that. We need to be more precise therefore about where that pressure comes from and how ruthlessly it is applied, instead of criticizing those whom it endeavours to crush. With regard to Sri Lanka, one source of pressure was Louise Arbour, who had been High Commissioner for Human Rights previously, and had tried then to obtain for herself a proconsular role in this country. This was prevented, but she changed the very positive Adviser her office had had in Sri Lanka, and appointed an American who seems to be at the forefront of allegations regarding War Crimes, going by the account of one of those who seemed surprised at the vehemence with which such views were expressed during the meeting summoned by the American ambassador. Needless to say, to substantiate the point I have often made about how the eminently decent senior officials of the UN are undermined, Ms Veliko had not obtained the permission of the UN to attend the meeting. Nor had the American Ambassador had the courtesy to obtain the concurrence of the UN leadership for her invitation. But this is typical of a body that believes it owes allegiance not to the UN, but to the predilections of its own leaders, who often follow a policy of trashing UN officials and UN procedures. The Indian Ambassador to Geneva had occasion to reprimand the current High Commissioner for Human Rights for attempting to undermine a decision of the Human Rights Council in 2009, and it is arguable that the pique of her office has contributed to current efforts to reverse that decision. And solidly in the forefront of this campaign was Louise Arbour, Navanetham’s predecessor, who has now taken over the mantle of Gareth Evans, another inveterate meddler with a Messianic vision of himself. It is now forgotten that some of the pressure on Ban Ki-Moon to appoint the Darusman Panel came from Louise Arbour. She told ‘Turtle Bay’, which has been one of the principal persecutors, in May 2010 that the UN was ‘close to complicit’ in government atrocities. Naturally Mr Ban Ki-moon was then reported as having ‘responded angrily to suggestions that the U.N. shared responsibility for the violence.’ In defending his own position, he lost sight of the full enormity of the claim, and so the canard that there were ‘government atrocities’ went unchallenged. On the contrary, the cornered Mr Ban said ‘he would move forward with the establishment of a panel of advisors to counsel him on how to hold perpetrators accountable for crimes during the decisive final months of the decades-long war’.